"It's all your fault!" she said monotonously, yet in a tone dripping with displeasure, causing her low voice to pierce through the quiet corridors of the nighttime emergency room. "It's all your fault! You're the one who's in the wrong!" As if to emphasize her point, Aisaka Taiga, sitting alone on the rightmost edge of the sofa, muttered under her breath again. On the same sofa, sitting as far left as possible, Takasu Ryuuji looked down at his own fingernails with his vicious, upturned, razor-sharp eyes. He had arrived early on the conclusion that no matter what he said, he would be wasting his time. Moreover, he didn't have the strength to argue anymore, nor was this the time to do so anyway. An ambulance drove past the window, the sudden, piercing siren causing Ryuuji to jump. The deafening siren cut off abruptly, as if stifled. Only the revolving red light remained; its flashes dragging Ryuuji's and Taiga's silhouettes across the linoleum floor. It seemed like the attached emergency department of the University Hospital was busier than ever, even on weeknights. He replied curtly. That is to say, it had been nearly an hour already since they had rushed here by taxi. Feeling depressed and unbearably weary, Ryuuji subconsciously sighed to himself. 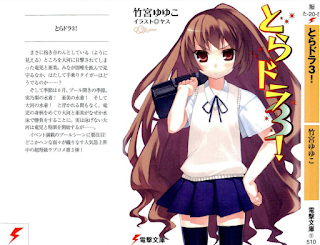 Next to him, Taiga sighed as well, and started to twirl her waist-long hair. Seeing her like this, Ryuuji told her, "You should go home first." "...needing a dog to be worried about me, I've really fallen far, haven't I? What I want to do is my business, not yours! If you try to order me around again..."
...as her low growl crept along the ground, their surroundings instantly transformed into a jungle that reeked of blood. In the center of this world that she ruled, Taiga cracked her right knuckles noisily. Her eyes that had avoided Ryuuji's for nearly an hour now looked straight at him, filled with terrible killing intent and overflowing contempt.